For a non-alcoholic version, use a good cloudy apple juice instead of cider, omit the sugar - and leave out the rum. Pour the cider into a large pan and add the other ingredients, except the rum. Heat gently on a low heat for 20 minutes; do not allow the mixture to boil as this will burn off the alcohol. 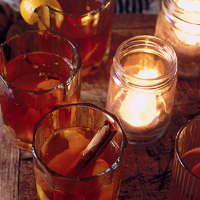 Strain the warm cider into glasses and add the rum, if using. Garnish with a cinnamon stick and a strip of orange zest from the pan.